In some parts of Scotland the schools here get 2 weeks holiday during October half term and that just happened to be us! It can be a long time for the kids without a routine of school days and clubs so we decided on our way home from Bluestone that we would pop back into Leicestershire for a few nights and visit more of the attractions on offer. It would give us something to do and also keep the kids happy and occupied. I hunted around for a cheap hotel for the four of us in the Leicestershire area as we still had Drayton Manor tickets to use and it’s close by but did you know it was still cheaper to book a Stay Play Explore break (which includes breakfast each day and entry into 3 major attractions) than booking a cheap hotel! 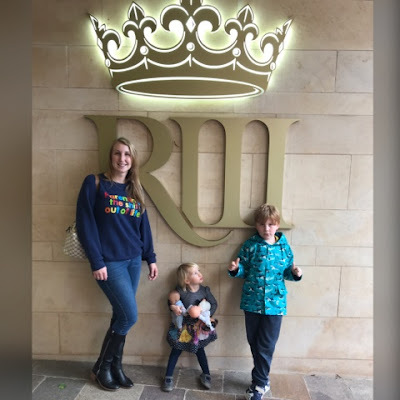 I was honestly shocked and quite pleased that the Stay Play Explore break was much cheaper and better value and this time we decided to stay at the Hilton Leicestershire Hotel instead of the Sketchley Grange Hotel. So as we left Wales to travel to Leicestershire we decided we’d pop into the Richard III Visitor Centre with our Stay Play Explore ticket as we would arrive earlier than check in time for our room. The visitor’s centre website advised people spend around 90 minutes at the venue so this was plenty of time for us to have a nosey before heading to the hotel. The Richard III Visitor Centre shows where they found Richard’s remains under the council car park and the whole place is dedicated to his life and how he died. It’s all very fascinating but definitely an attraction for older kids. Logan was quite fascinated and read all the different information but as you can imagine Harlow ran around a lot which was fine as she was happy. The hotel was very easy to find and just off the motorway. With it being a Hilton it as all very modern, the room was massive with two double beds, a big TV, sofa, desk, bathroom etc and the staff were lovely. We even received a package of goodies every morning including wine, bottled water, nuts and sweeties for the kids. Even the breakfast was tasty with lots of options. I even asked for plain granola one morning and it was never too much trouble. Totally fab place to stay. The next morning we decided to hit Drayton Manor as it was meant to be a nice day and I'm glad we did. It was so hot and sunny it really was the perfect day for a theme park. 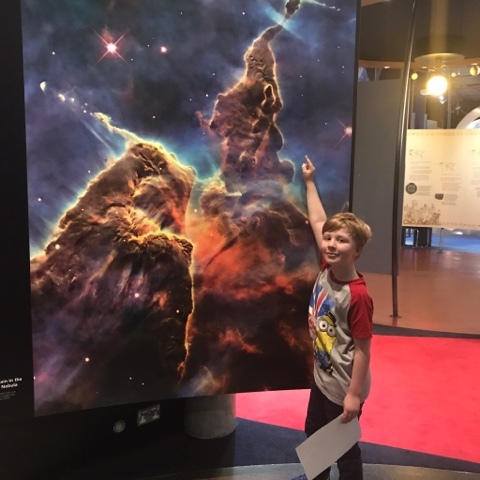 On our last day we decided to squeeze in two of the Stay Play Explore attractions so we visited the National Space Centre again since it was a bit drizzly. It was Logan's choice and he had a brilliant time. Since it was almost half term in Leicestershire there was lots of extra Halloween activities on for the kids. So something different from our last visit and they had a new exhibition open. In the afternoon we drove a quick 20 minutes from the space centre along to Stonehurst Family Farm and I'm so glad we visited. 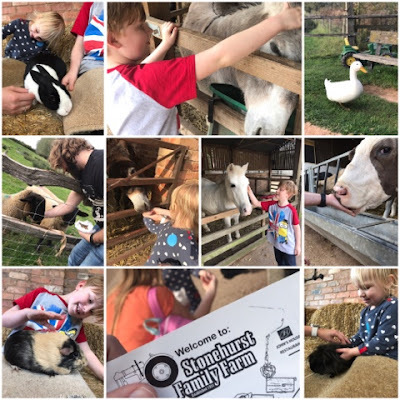 It's a real life working farm that has just had a few things added for the kids like a play park, tractors and pony rides etc but it was amazing. We got two bags of animal feed as part of our Stay Play Explore entry into the park and it was great as you get to feed all the animals up close. I think this was the highlight of the kids weekend as they couldn't get enough. Normally Logan's not fussed for animals but since he got to touch and feed them he was thrilled. As you can see from the photos we all had a totally awesome time and I can't recommend Stay Play Explore enough. It's such excellent value and we've been 3 times now! Definitely booking up to go again soon. We've had our fair share of Lego sets in this house so I'd like to think we're all pretty close to being master builders! Even little Harlow who's only 2 years old has a good few sets of Duplo at her disposal. Recently we were contacted by Lego to see if the kids would like to review some new sets of theirs and I couldn't agree fast enough. 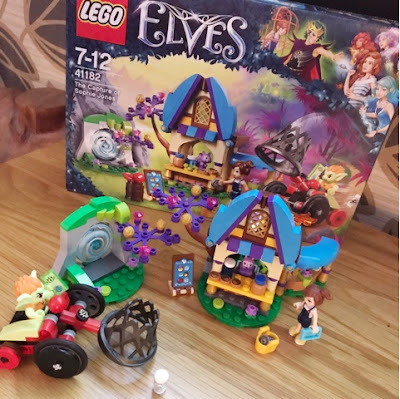 Harlow was sent a gorgeous little Lego Duplo Pets set and Logan got one of the new Lego Elves sets. Both sets looked fantastic and since they arrived when Logan was at school I kept his for later and got stuck into Harlow's Duplo. 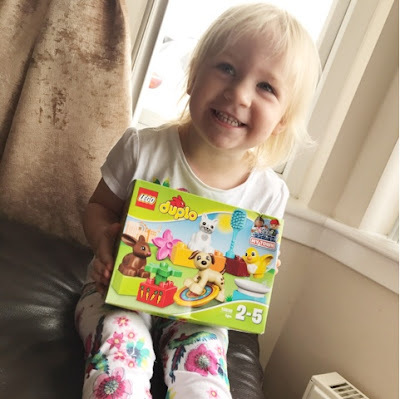 Harlow received the Duplo 10838 Family Pets Building Set for ages 2-5 years which contained 4 different animals and accessories to build and play with. Her little face lit up when she saw the box. She's a mad animal fan and wanted the box open as soon as humanly possible. I really do love Duplo in our house. It's the perfect size for Harlow and is so robust it lasts forever. She played with this set for a good hour and has gone back to it again and again. She also has the Duplo train set so we've been mixing them together for more play time fun. Included in this set were a dog, cat, rabbit and bird. They each have a little accompanying Duplo part such as the frisbee for the dog and carrots for the rabbit. This particular Duplo set retails for around £8.99 which I think is a fabulous price. It would definitely make an excellent present for a birthday or Christmas. Sometimes I like to get kids the odd present when I travel as well and prefer to order them some Lego instead of the usual holiday tat so why not do that yourself next time. Logan too was super thrilled with his Lego Elves 41182 The Capture of Sophie Jones. It's seems very magical and is brightly coloured so eye catching and Logan was pleased to have the chance to build it. This is the first time he's had Lego Elves and his reaction to it was lovely. 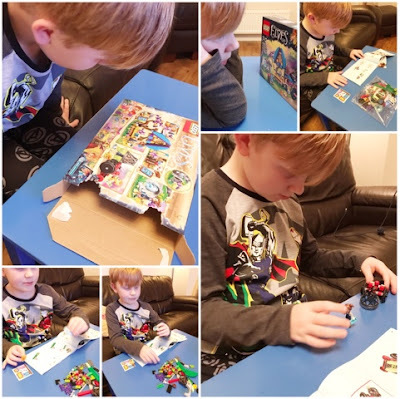 I thought he may think it's a bit girly but it honestly isn't and anyone can enjoy Lego, even myself and the other half quite like some Lego building. In this set there are 3 separate parts to build. There's Mr Spry's grocery store, goblin capture mobile and a magic portal. 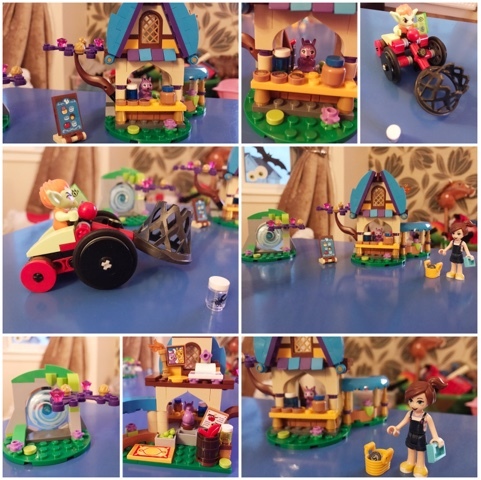 The mini figures that go along with it are Sophie Jones, Barblin the Goblin and Mr Spry the squirrel. It's really very sweet and your aim is to make sure Sophie sneaks through the magic portal to Elvendale and escapes before Barblin the Goblin catches her! I love that after you build this set it's still going to provide hours of fun. There's lots of little fiddly bits and pieces like apples, jewels, money, flowers etc and I loved all of this as a child. It just made everything more interesting and Logan liked it all the more because of those small pieces. Lego Elves 41182 The Capture of Sophie Jones is for ages 7-12 years and retails at a very reasonable £17.99. It's a fantastically affordable set and again would make an excellent gift for someone's birthday or Christmas. Even as a reward of some sort for good behavior maybe? I'll definitely be recommending both sets to family and friends as they're really good and excellent quality as you would expect from Lego. Why not take a peak online and see the whole new Lego Elves story in action? I was sent both products for free in return for an honest review. All opinions are my own. 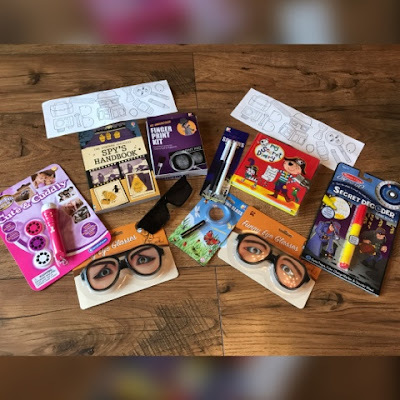 As an autism Mummy I'm always on the look out for toys that will stimulate my son's senses and be of benefit to his development in this challenging world we currently live in. 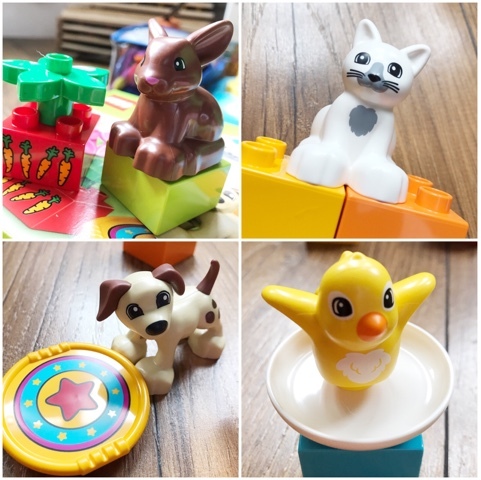 I've tried and tested a few Moluk Design toys before so when they offered to let Logan and Harlow road test some more toys I happily accepted. So who are Moluk? "Driven by a passion for great design, MOLUK strives to create innovative, sustainable products that don't just entertain kids on a superficial level, but invite real interaction. In a time where everything is getting more virtual, MOLUK offers toys that are totally manual, toys that get children to move and explore, toys that stimulate their senses and minds. 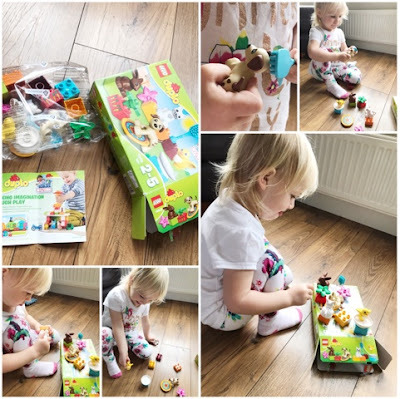 There are no ON and OFF switches, batteries or complicated instructions – MOLUK toys are powered simply by a child's imagination." Logan and Harlow were lucky enough to receive three different toys from Moluk. They got the bilibo, plui rainball and plui rain cloud. I honestly couldn't wait to get my hands on these products never mind the kids and there was much excitement when they arrived. The first toy to take the children's eye was the bilibo. 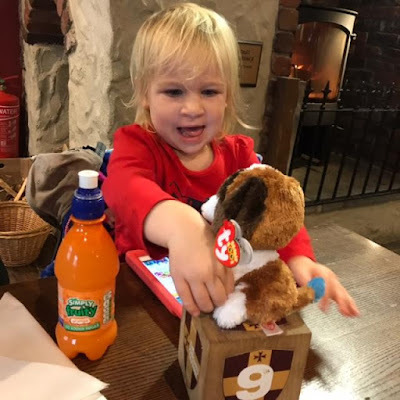 It's a multi-award winning open-ended toy which is remarkably simple yet the kids keep going back to it again and again. 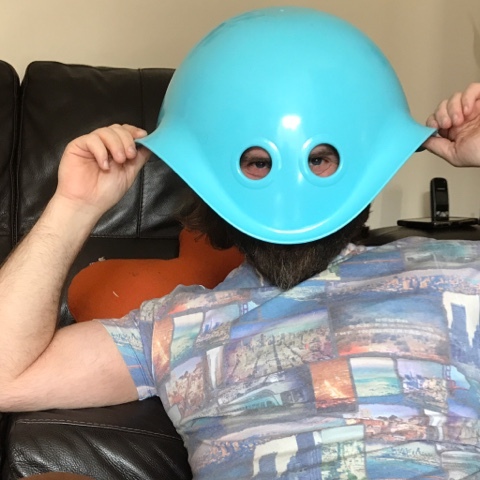 We received a lovely light blue bilibo, Logan's favourite colour, and it's shell like shape had the kids jumping all over it immediately. Both Logan and Harlow decided it would be great fun to sit in it and have us adults spin them around and around. It goes pretty fast when you get the right balance. It reminded me of a tortoise shell and can be used for lots of different play. My two definitely loved sitting in it on the sofa and hiding under it. Harlow even had her baby dolls in it for a bath and bed time. Logan really liked the smooth feel and the way it hugged his body when he sat in it. He felt secure and comfortable. It really is great and for something so simple as a curiously shaped piece of high quality plastic the kids love it. Here are a few facts about bilibo to wet your apatite. It comes in 8 different bright colors: blue, red, yellow, pink, orange, green, light blue & purple. It's 39x39x22cm, weighs 750g and would you believe is fully recyclable! 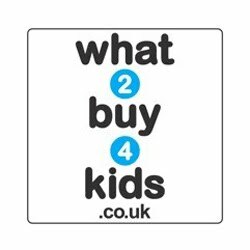 It's recommend for ages 2+ and costs £24.00 here in the UK. 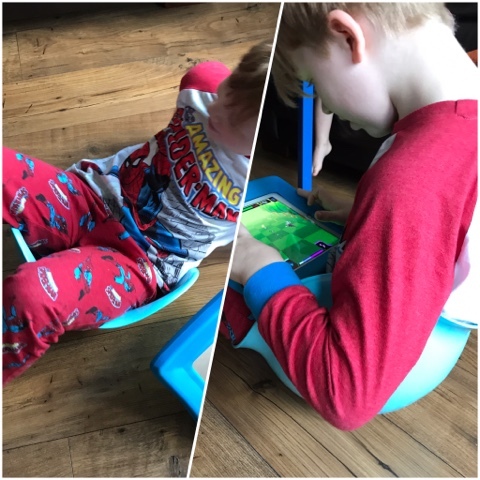 I really love the bilibo as do Logan and Harlow so would highly recommend as a toy with a difference. Logan gets fed up of toys quickly now that he's almost 8 but this just has so much going for it. Next up are the two plui products. One is the rainball and the other the rain cloud. The rainball is round as the name would suggest and it's super easy to use. We tried it in the bath to start with as that seemed the most sensible option. So you dunk the rainball right under the water, it'll start filling up through the little hole in the top. You then cover the little top hole with your finger when you bring it out of the water and when you're ready remove your finger and it will then rain out like a cloud through the bottom 11 holes. It's so simple but so totally genius and the kids absolutely love it. The plui rainball has a hard plastic top and a soft silicone rubber bottom for different sensory sensations. 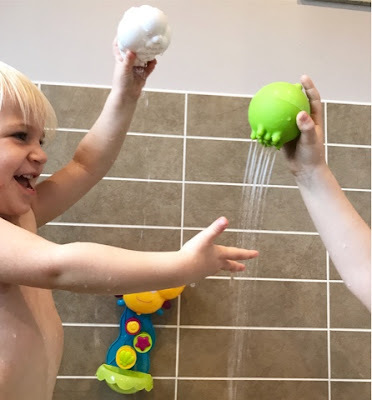 The rainball can be squeeze open in the middle for easy cleaning unlike other bath toys so will literally last ages. 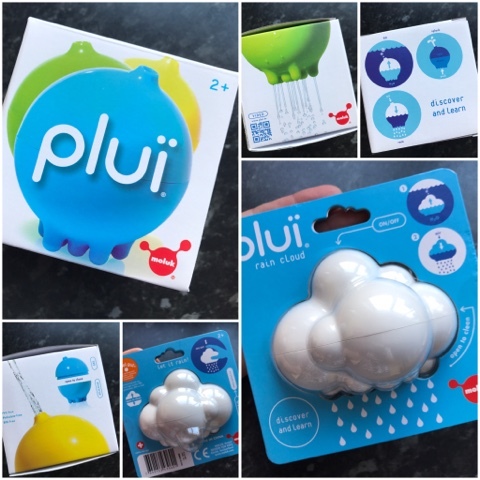 The plui rainball comes in 3 colours; blue, green and yellow and is 8.5cm in size. We received the green rainball and it's very bright and eye catching. The plui rain cloud is white in colour and works in exactly the same way as the rainball however it's fully hard plastic instead. Both Logan and Harlow loved these bath toys. It's good that they had one each as they were fighting over one until I introduced the other. 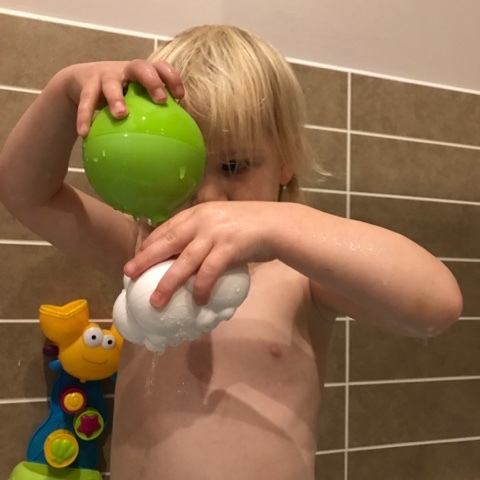 Harlow likes to pretend to make it rain over her bath duck and other toys whilst Logan liked to repeatedly fill it up and feel the rain effect over his body. It's a really nice sensory feeling for him and helps him to enjoy bath time. Both the plui rainball and rain cloud retail for £9.00 and the rain cloud is 92 x74 x 70mm in size. They're recommended for ages 2+ but I'm sure they would be great for babies too with the help of an adult. All Moluk toys are made without PVC, BPA, phthalates, latex or lead and conform to the latest European and US safety standards. We really did love our Moluk toys. So much so I even made a quick little video so you can see them in action. So please feel free to take a look. I was sent these three products for free in exchange for an honest review. All opinions are my own. 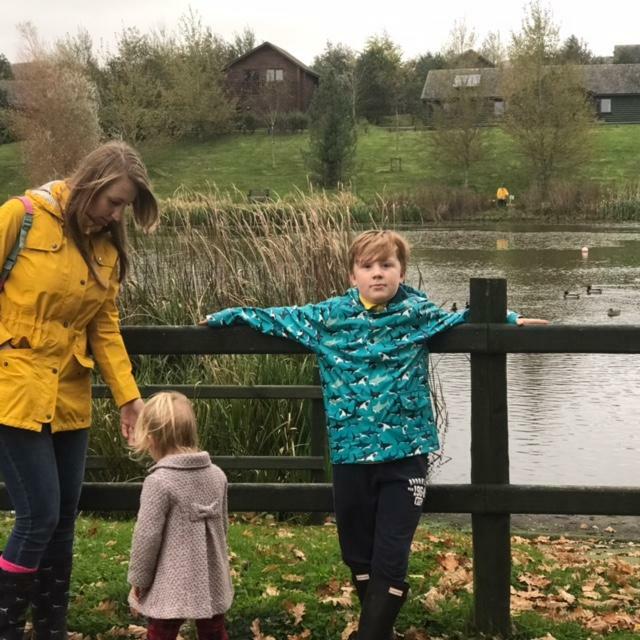 Last week the family and I were invited along to stay at Bluestone in Wales for the October school half term holidays. 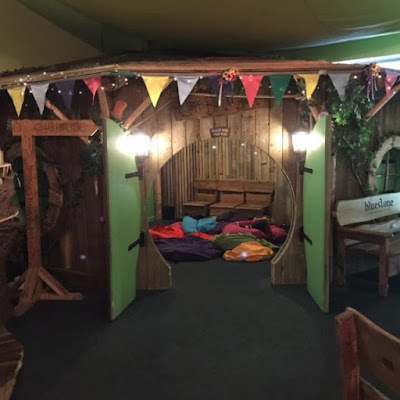 We had visited Bluestone back in June of 2016 for the other half's birthday and the kids couldn't wait to go back and get stuck in to all the activities. So what is Bluestone? 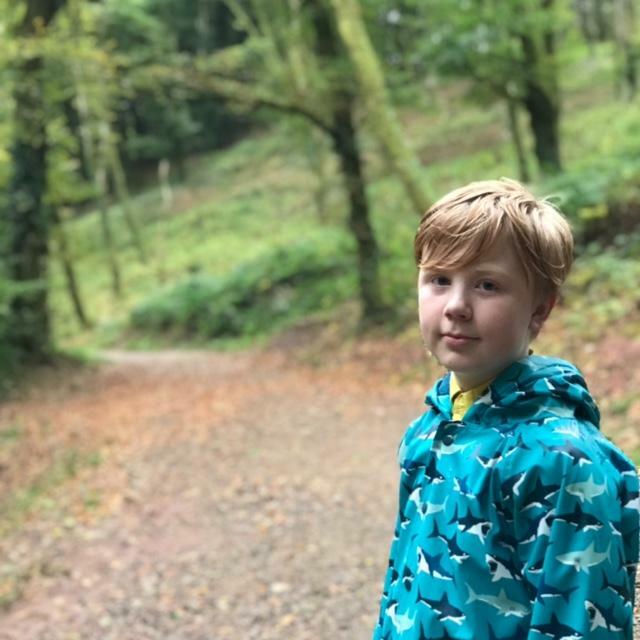 It's a lovely family friendly national park set in South Wales which offers self catering log cabins and cottages throughout the year. It has everything you need on site from shops and restaurants to a massive swimming pool and adventure centre so you don't even have to leave during your stay if you don't want to. It really is lovely so read on to find out how much everyone enjoyed themselves. Our drive from Fife, Scotland to Bluestone in the South of Wales can be a little bit of a journey however the kids love a road trip and 8hrs in the car actually passed by reasonably quickly. We stopped at lots of services on the way down and chatted about how we'd spend our week at Bluestone. Finding Bluestone was easy as it's well signed posted and if you have a sat nav (like we do) it takes you straight to the door. Upon arrival it was nice to see an efficient queue system set up for cars to easily drive up to the reception windows, check in, get the key to your log cabin with welcome pack etc and then just drive right in to find your home for the week. Bluestone operate a one way system and cars are generally only allowed to drive the resort on Monday's and Friday's as these are check in and check out days. At no other time are cars allowed (apart from disabled) and this works really well. One of the perks the kids love about exploring Bluestone is that you can hire a golf buggy or bikes and tour the resort that way. Last year we hired a golf buggy and this year we did the same. You honestly don't have to though but it works wonders when you have small kids with tired legs. 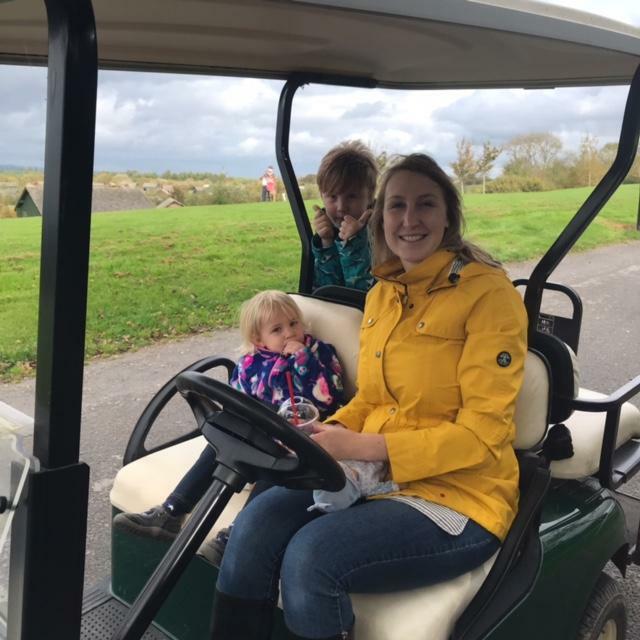 I'd recommend pre-booking your golf buggy as essential especially during busy peak times as they go quickly. Booking any transport, activities and events can simply be done by logging into your holiday reservation on the Bluestone website and paying online. This is how I did it last year and this year and it's super easy. You can of course call the dedicated booking helpline if you prefer. Once we found our accommodation and unpacked the other half dropped the car off at the parking lot and picked up our golf buggy. 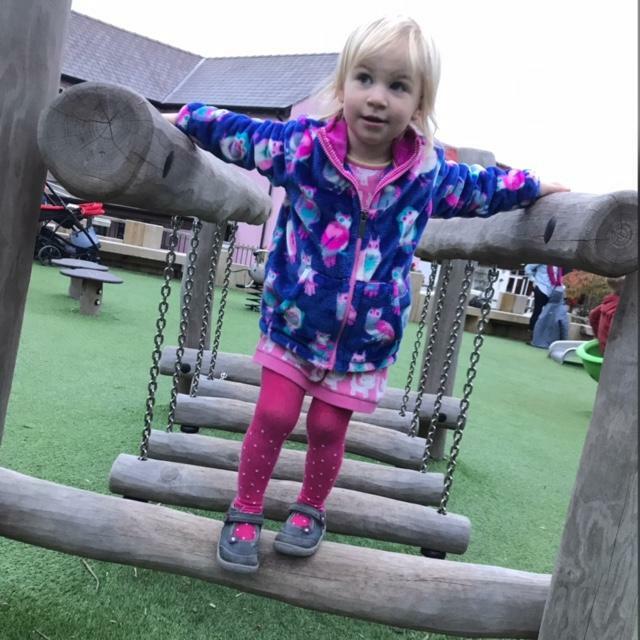 We then decided to visit the onsite grocery shop for some essentials and let the kids play at the fabulous new play park in the village since they had spent so long in the car. When it started to get dark we jumped back on the buggy and headed home via The Chippy to pick up some tasty fish and chips for dinner. All of the Bluestone accommodation is of course self catering but there are plenty of venues on site you can visit for a tasty treat. Our accommodation was clean and modern and perfect for a family of 4. It had a large open plan kitchen, dining and living room with 2 bedrooms off to the side plus a wet room with toilet etc. It's all we needed for the week and we were very happy with it. Whilst eating our fish and chips I decided to check out activities for the kids from the documents included in the welcome pack and was glad to see a whole host of possibilities. 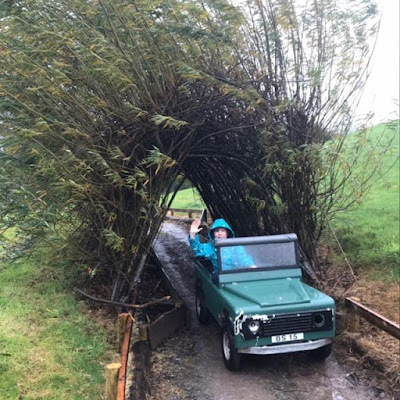 Logan was super eager to do the 4x4 Safari again and I noticed they had a creche for 0-3 year olds so thought I could pop Harlow in there for a few hours. Each day of our stay was filled with some activity or another but to give you an idea we visited the Blue Lagoon swimming pool (exclusive guest only access from 9am to 12pm), attended the Shadow Puppet Show, booked Logan into Bluestone Buccaneers, went on forest walks to visit Camp Smokey, visited the Adventure Centre, played crazy golf, Logan did the Sky Trail and climbing walls, played on the bouncy castle and played the games machines in the Adventure Centre. It honestly would have been a challenge to get board here as there's just so much to do. When I booked the kids into the Shadow Puppet show I was slightly terrified that Harlow wouldn't sit still and would be a complete diva throughout! However I was pleasantly surprised to find out that the Shadow Puppet show it completely interactive for the kids and adults with lots of dancing and games so it was a brilliant success. I'd highly recommend this for the kids if you're visiting Bluestone. 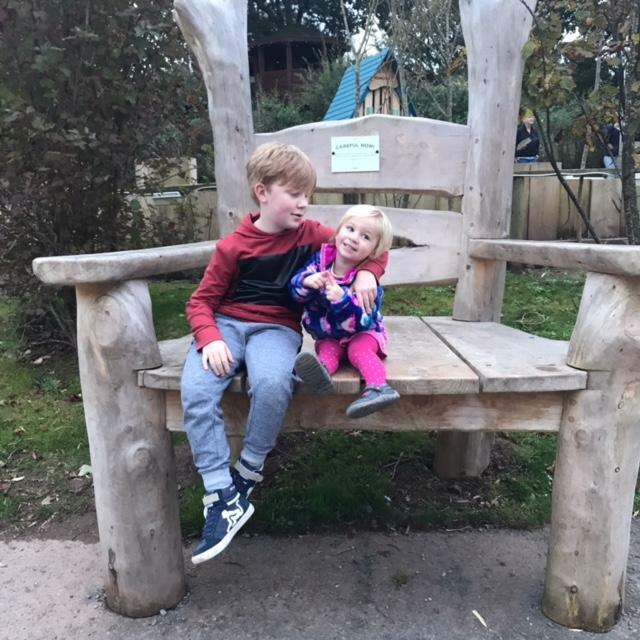 On the Thursday afternoon of our stay I booked Harlow into the Woody Wild Creche for 3hrs and also booked Logan into the Bluestone Buccaneers for 3hrs at the same time. This meant that the other half and I could enjoyed a lovely forest walk in peace without the kids moaning of being tired or having to carry someone. Harlow loved the creche and Logan thought the buccaneers was fantastic. It's for ages 4-7 years and I'd highly recommend this activity too. The staff that took this group were all dressed up as pirates and really got into it which the kids loved. Tons of fun. The evening before we left we decided to visit the village and let the kids play at the park again for one last time. I had noticed on a few noticeboards that there was going to be some Halloween events so we hung around to see what was going on. It was actually really good as there was a good few Halloween themed games for the kids and we also welcome the Halloween parade that had walked down from the Adventure Centre. It was a lovely last night and everyone had a great time. 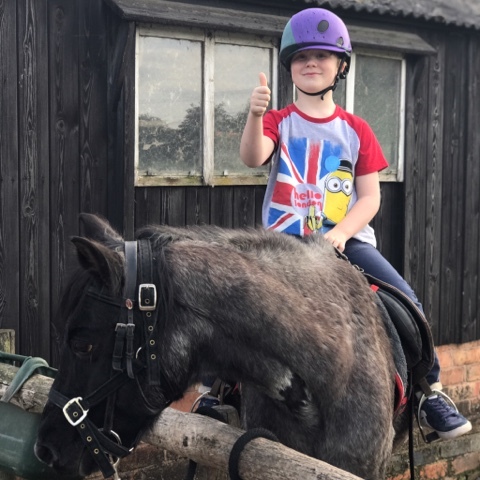 Everyone loved their stay with Bluestone and even after having been last year there was still lots and lots still to do and see this year. When Logan turns 8 he'll be able to go back and do so much more activities as there's Sky Wires, High Ropes, Archery, Crossbow and Laserclay still to be done. I'm not sure we'll ever get fed up of visiting this place! 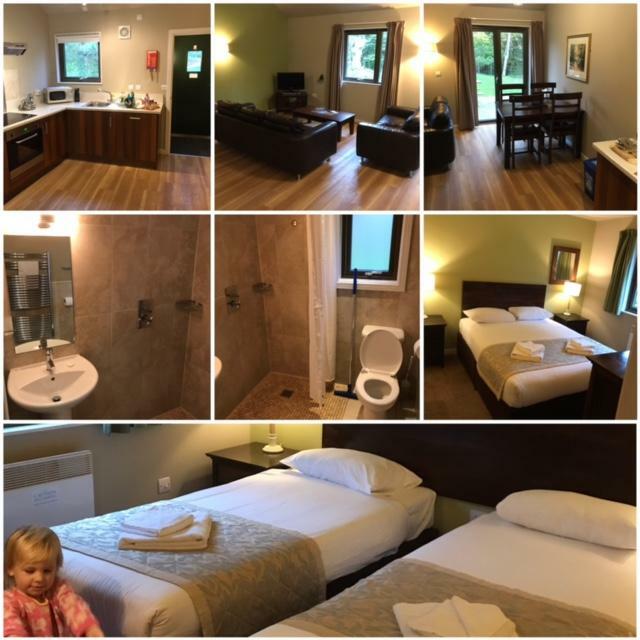 We received a free stay at Bluestone in exchange for an honest review. All opinions are my own. 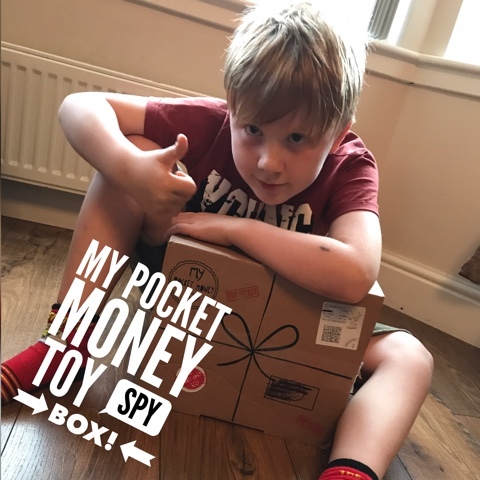 This month's My Pocket Money Toy subscription box was a super top secret one! It was literally crammed full of totally awesome spy accessories which Logan couldn't wait to try out and of course a little something for Harlow. So let's get straight to it, what was in that box? 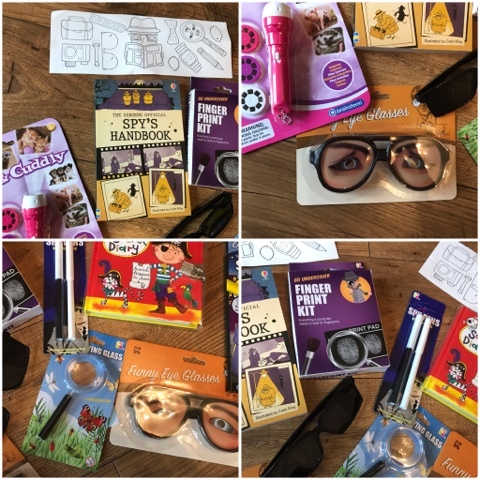 Logan received two pairs of funny eye glasses, one secret decoder book with pen, a finger print kit, spy pens, a secret diary, magnifying glass (which Harlow stole), the Usborne Official Spy's Handbook, some colouring in sheets and spy glasses which can be used to see behind you. He totally did love it all but I think the secret decoder and spy's handbook was his fav. 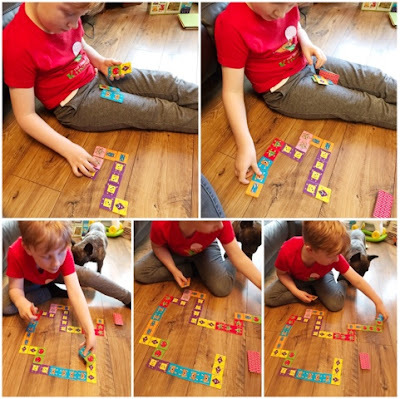 After he had opened his My Pocket Money Toy Box Logan went straight for the secret decoder book and got to work completing the activities. It's a super little book with a built in decoder at the top right hand side and this helps kids complete the secret activities on each page in side. The pen is there because it helps show some hidden messages and answers when drawn over the pages. Really brilliant and a definite favourite. That night Logan decided to take the spy's handbook up to bed with him and he read it for a good couple of hours. Some of the things in it were hilarious and probably gave Logan some cheeky ideas or two on how to be a good spy. Great fun and a fab book he keeps referring too. The finger print kit was also a firm favourite of Logan's and we had to try it out straight away. It basically does what it says on the box and gives kids the ability to take finger prints or dust for finger prints and lift them onto special paper. Logan really enjoyed this and we had several attempts at it each. Watch out burglars! Harlow received a little something too which was a fantastic Cute & Cuddly slide show flash light by Brainstorm. Now that the darker nights are here she is able to look at tons of cute baby animals on her wall in her room. All in all another extremely well thought out subscription box which met all of Logan's wildest dreams. We even managed to get a little unboxing video this time so please to take a look and see all the goodies for yourself. I was sent this box in return for an honest review. All opinions are my own. It's finally October and that can only mean one thing! Halloween is almost upon us. The nights are getting darker and chiller and we'll soon be dressing up our kids to take them trick or treating. That's all fabulous but sometimes I like to take the kids to other events to help celebrate Halloween. 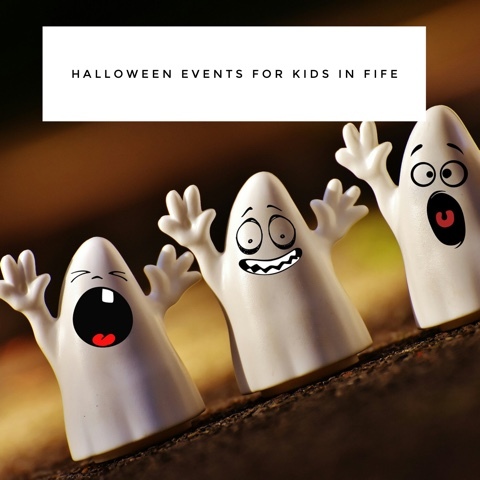 In that case I've compiled a list for you lovely lot on Halloween events for the kids in Fife and the surrounding areas. 7th October -1st November: Pick Your Own home-grown pumpkins. Cairnie have many different varieties for you to choose from and this is a great activity for the kids to get involved with before the actual carving or painting of their very own pumpkin. 27th, 28th, 29th & 31st October: Spooky Torchlight Maze Nights recommend for children aged 8yrs+ as it's not for the feint hearted. It's £8.50 per person and be very prepared to be scared! 27th October 4-6pm: Bongos are hosting their very own Halloween Party! Go dressed in your best Halloween costume as their a prize up for grabs for best dressed boy and girl. The party will be jam packed with lots of exciting activities from terrifying times, ghouling games to some deathly dancing. 29th October 10am - 5pm: Step down into the underworld at Wonder World Soft Play in Kirkcaldy for a spooky start to Halloween, on the 29th of October. There'll be a mix of fun Halloween games, including a ghoulish treasure hunt with some amazing prizes! There'll also be some creepy arts and crafts as well as face painting and goo filled Halloween games. Make sure and dress up, adults too! 28th, 29th, 30th & 31st October: Join Fife Zoo for their bigger and better Halloween party and games after dark at Sloth Play! There'll be a fancy dress competition with 1st, 2nd & 3rd place for kids and of course best dressed adult! They'll also have Halloween themed cakes, special coffee menu and homemade soup (£3.95) available for adults. It's £10.95 per child (includes admission to Sloth Play) and adults are free. Tickets can also be purchased over the phone by calling: 01337 258214 or from Africafe on site. 31st October 9.30-11.30am, 12.30-2.30pm & 3.30-5.30pm: Tickets will be £8 per child and will include - Entry 2 hour play session in Little World of Play, a Spooky picky plate with a hot dog, sandwich or toast in the morning, fruit, crisps and spooky treats! A cup of squash, water or milk. Halloween party games and crafts in the party rooms. 28th October 10.30am - 1.30pm: Every year Autism Rocks Fife have a lovely Halloween party for kids so if you have a child in your life affected by Autism then why not take them along to enjoy some Halloween fun. There'll be loads of different activities and games but it's in a safe and secure environment so everyone can have fun. There's so need to book and it's totally free. Remember to dress up! 28th & 29th October 12pm - 4.30pm: The Stoats Creepy Crawl - Put on your bravest face as you take on eight spine-chilling challenges including Apple Dooking, Grave Grabbing and The Enormous Neep Heap. On completion of these terrifying tasks you’ll need to ‘guise’ to claim your prize! There’ll also be other spooky activities to keep your little ghouls and ghosties entertained. Make sure you come disguised in your scariest costume as there’ll be prizes for the best dressed! To ensure the best possible experience there will be time slots available. Time slots are for entry only, you will be free to spend as long as you would like in the gardens. Adults are £6.50 and Children are £4. Tickets available here. 28th & 29th October Various Times: Boo at the Zoo Halloween Special. Join the Zoolab Jungle Room in your best costume for their interactive animal-handling experience which will give your family the chance to help the sorcerer collect ingredients for his magic spell. Each session is 1 hour and adults cost £3.50 and children are £5.00. Saturday, 28th October – 11am, 1pm, 2pm & 4pm. Sunday, 29th October – 10am, 1pm & 4pm. Booking recommend, please visit bookwhen.com/zoolabjungleroom or call 01324 667356. 29th October 10.30am -12pm or 1pm -2.30pm: It's Pumpkin Party time!! The people at the Ecology Centre will be raiding their pumpkin patch and getting their craft box out to carve some creative spooktacular pumpkins. It's £3.00 per session with tea/coffe/juice and spooky treats provided. Total bargain if you ask me! Tickets can be booked online here. 28th October 4.30pm - 8.00pm: Halloween Event. Join Craigtoun Park for a fun-filled evening of Halloween high jinks. Ticket price of £6.00 each (under 3s free) includes a ghostly tractor ride through the park plus a hot drink and halloween treat in the cafe. Professional story-teller, Sheila Kinninmonth will be telling spooky stories and terrifying tales while Stevie Mills, The Balloon Modeller, will be leading the party games at the kids' disco. 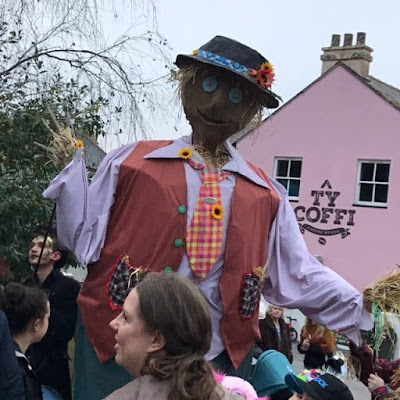 Bring along a pumpkin to take part in the Lantern Competition and join in with the Fancy Dress Parade – 1st, 2nd & 3rd prizes will be awarded for each. In addition to all this you can take a selfie at Dinner With The Dead display in the Octagonal Shed and enjoy some traditional apple dooking. To book your ticket, please call the Ticket Office on 01334 472013. 31st October 4.30pm: Halloween Family Supper. Calling all wizarding folk – dress up in your favourite Halloween costume for the Halloween Family Supper. There'll be a scrumptiously spooky menu, served by a team of witches and warlocks which will enchant the whole family and fun Halloween activities will keep the little goblins entertained too. Muggles need not apply. More information & tickets here. 27th, 28th & 29th October: Follow the magical light trail, explore the woods, pass the ancient graveyard, discover the lit-up moat and get lost in Tullibole’s Witches Maze! This year there is 7 incredible individual sound installations, each with a different musical accompaniment. With selfie stops throughout, be sure to dress up and enter the Halloween competition for the best-dressed family! The Tullibole Trail photo competition will return this year with prizes for Best Atmospheric Photo and Best Selfie. Get your tickets here. 28th October 5.30pm - 9pm: Perth’s the place for spooky and kooky Halloween fun. Get in the spirit by dressing up and taking part in a costumed parade through the city centre. Or practise running from ghouls by taking part in the Halloween Howler, a junior race for 6-12 year olds, or take the Halloween Screamer zip wire down the High Street. For grown-ups looking for a bigger fright dare you brave the Castle Horror 666 Zombie Maze? This event is free and there's no need to book just go along. I recently attended a mental health training session through my work and one thing in particular resonated with me. When discussing what we can do to make ourselves feel better the presenter announced that we're so busy looking after everyone else around us that if we don't take time for ourselves then inevitably some of us will have a break down at some point. And she was right because if you can't look after yourself properly then how can you look after the kids or others around you? It just doesn't fit. So by looking after yourself and making sure you're in a good place it means everyone else benefits. I think everyone during their life struggles with the balance. There's always something to be done, someone to be looked after, bills to be paid, money to be maid etc and frankly we really can't do it all. Some people might look like they do it all perfectly but behind closed doors it's probably a different story. There's no shame in admitting you need help and support people. Parenting has to be one of the hardest things I've ever done and it totally zaps the energy right out of you. It's also one of the most rewarding things in my life and watching two young people laugh and grow is amazing. But there are times when I'm just exhausted and need some me time hence why I blog. It's something for me and something I enjoy. As well as blogging I also love to read fiction when helps me escape into another world when I need it. 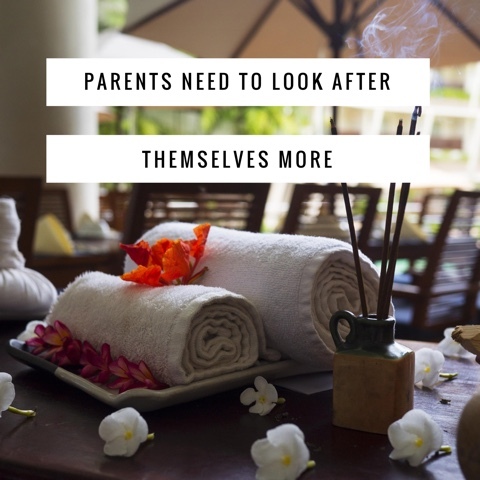 With that mind here are a few words from fellow bloggers on how they take time out from the grind and look after themselves first so they can in turn provide better care to others. Charlie from Our Altered Life says: I enjoy walking the dog around a local reservoir. It also means I have 30 mins off my phone which is a huge part of my life and sometimes can be a source of distraction and more anxiety. Deep breathing and being present in the moment are key for me to stay balanced and calm. Sophia from Tattooed Tea Lady says: I make sure I spend at least 5 minutes everyday reading during the day and every night before bed. For me, it's a sure fire way to relax and unwind and get lost in another world for a bit! Katie from Living Life Our Way says: On a daily basis, I watch TV by myself when everyone else is in bed to unwind. But my favourite way to really take time to myself is going to gigs - love a bit of live music as de-stress therapy! Sarah from Toby Goes Bananas says: I was struggling to find time to exercise even though I know it makes me feel better, so I’ve been doing yoga videos off YouTube in the evenings after the kids are in bed and it’s brilliant. Jenny from Monkey and Mouse says: I like to go for a cycle on my own, whizzing fast down the hills with the wind in my hair! It feels so free! Sarah from Mummy Cat Notes says: I love to play games in the evenings, there is nothing more relaxing for me than loosing myself in a game for a few hours! 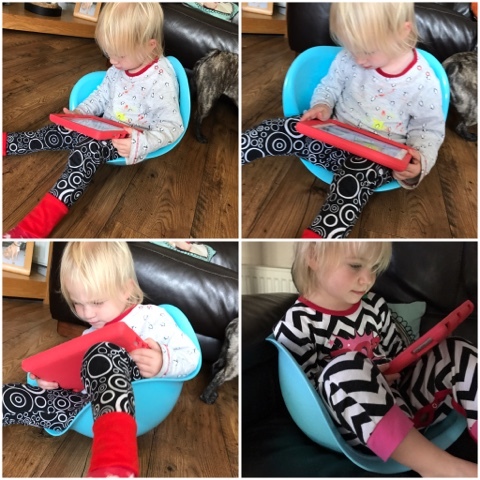 Sarah from Digital Motherhood says: Every so often I have an afternoon to myself on a weekend. Will pop into town, get my haircut or just get a drink in Starbucks for a little bit of peace while the husband takes our daughter to the park or wherever. Feel so much better after a few hours by myself! Susan from Susan K Mann says: Reading a book is always relaxes me. I tend to read something in a supernatural/fantasy genre as real escapism. Stephanie from Renovation Bay-Bee says: Me and hubby always have one evening a week where we eat dinner on our own. We give the kids their dinner earlier, and we sit down together and enjoy a peaceful dinner! Louise from Pink Pear Bear says: Running is my sanity saver! I often leave the house raging and come back all zen and calm. If I don't do enough exercise I get antsy and stressy. Jeannette from Autism Mumma says: Crochet relaxes me, I learnt last year and it was the best thing I could have done for my wellbeing. Music is also very calming, I have "mellow moods" and "go to" playlists on my phone. Love to read fiction too. Emma from Emma Reed says: I make sure I find time to exercise every week. I usually drop my son off to pre-school then go to a 9:30am class but it is also a kid-friendly studio so he can come along and watch if childcare is an issue. Exercise definitely makes you feel more energised, happier and can also be very sociable. Christy from Welsh Mum says: Setting aside 1 hour in the night to play video games after the baby is asleep relaxes me. I've always enjoyed gaming and am a bit of a techie so that's my me-time! If I'm frustrated I can beat something up in a virtual world but I often play simple, relaxing games that just let me forget about all the worries of the day. Claire from Bumps Babies Tots and Teens Mummy Diaries says: Mindful colouring books, journaling, going out for a walk, put on your favourite tunes, exercise, doing anything you love that isn’t child related. Phone a friend, invite a friend round for cuppa or wine...I could go on. Elaine from Entertaining Elliot says: I belong to my local community choir and it's so nice to have that one evening a week where I can leave the craziness of being a mummy at home and just be Elaine! Singing is good for the soul! 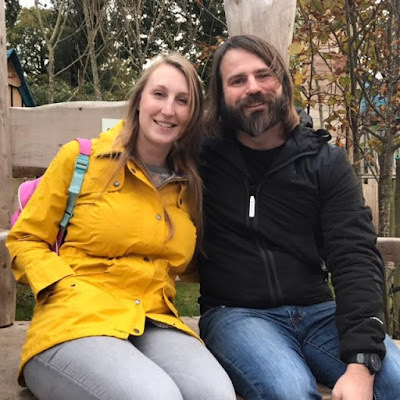 Kelly from Reduced Grub says: I work 33% which is a super part time contract for an airline and every 6 weeks I do between two or three long haul flights and have some days away. On my first night away, I lock myself in my room, lose a stone in weight by shaving my legs and order room service. At home I am Mum and I love it but when I'm away, I get recharged and get pure me time. Being an Official Toy Tester for Orchard Toys means the kids and I get to try out all sorts of brilliant games which is amazing. The best bit is that I then get to tell all my lovely readers about these games so you can make up your mind before you buy. The fab thing about Orchard Toys is that they always have an excellent educational quality about them so no matter how much fun the kids are having they're always learning. 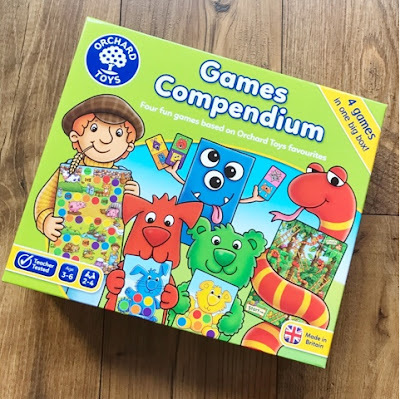 So for this month's Orchard Toy review I have the fantastic Games Compendium box which has four fun games based on Orchard Toys favourites. 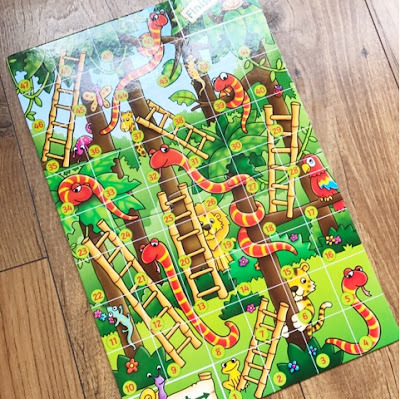 You've got Jungle Snakes & Ladders, Monster Dominoes, Old MacDonald Game and Red Dog Colour Game. 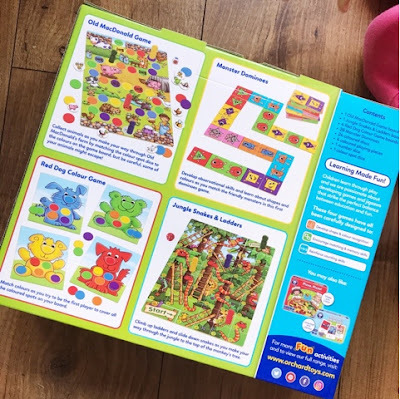 This box full of fun games is aged at 3-6 years and can have between 2-4 players per game. Because I have a 7 year old and an almost 3 year old Games Compendium suited us perfectly. Plenty of games for the 7 year old to play but still enough games for the almost 3 year old to get involved in. To start with I thought I'd play a few games with Harlow when her brother was at school to give her a chance to get a feel for everything and so her big brother didn't take over. Her favourite had to be the Red Dog Colour Game. 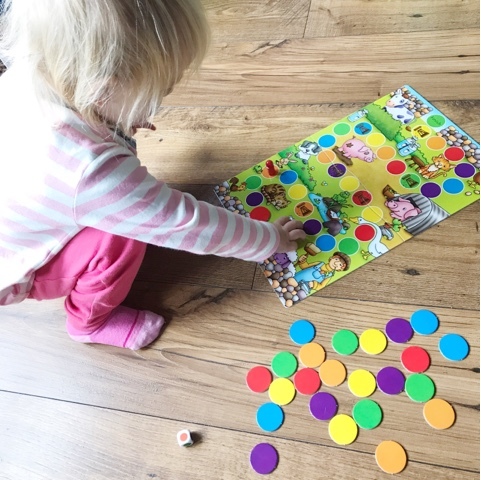 It's a matching colour game and was very easy for Harlow to understand. She's still getting to grips with her colours so this was amazing for helping her to identify them. 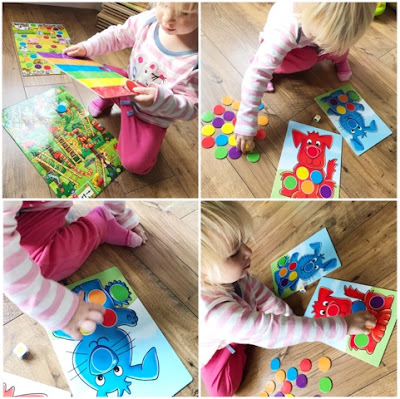 Learning through a game is much more fun than Mummy spouting colour names at you. Anyway so this game is a match the colours game and it's the first player to cover all the coloured spots on their board that wins. You get four different boards; a blue rabbit, green teddy bear, yellow teddy bear and red dog. Each board has coloured spots on it and there's 24 coloured discs and 1 colour spot dice that comes with it. To play you choose a board each and spread out the coloured discs colour side up in front of you. Youngest player goes first and rolls the colour spot dice. Whatever colour it lands on the player looks for that coloured disc to then cover a spot on their board. This basically continues until someone's board is all covered. Pretty easy. Next up is Monster Dominoes. Another fab and easy game to play but still tons of fun. Logan really enjoyed this game and we've played it several times now. Might even take it away with us when we go on holiday soon. You get 28 domino cards all with different colours and monsters on them. To play you shuffle the cards and deal each player 7 cards, placing the remaining cards in a pile face down on the table. The youngest player goes first putting a domino down then the next player has to match a monster to it. If you're unable to match then you take a domino from the pile. Game play goes on like this until nobody can match any of their dominoes or if one player has played all their dominoes and wins. Jungle Snakes & Ladders is pretty self explanatory but is still a fabulous all time classic game. I remember playing it as a kid and getting so frustrated when I landed on a snake! Ah memories. There's 1 playing board, 4 playing pieces and 1 number spot dice with this game. Youngest player goes first as always, they need to get an advantage after all, and the winner of the game is the first person to reach the monkey finish space. Last but not least we have the Old MacDonald Game. It's a brilliant game if your child likes animals like my daughter. She couldn't wait to have this all set up to give it a go. You get 1 jigged playing board, 24 coloured discs, 4 playing pieces and 1 colour spot dice for this game. It's worth noting that the coloured discs from the Red Dog Colour Game are used for this game too and they have animals on the back. Luckily it means you won't have tons of tiny pieces in the one box. Anyway, the object of the game is to be the player with the most animals at the end. To play shuffle and spread out the coloured discs colour side up in the middle of the table. Each player has to choose a playing piece and put it on the start space. The youngest again goes first. You roll the colour spot dice and move to the first space along the path that matches the colour shown on the dice. The player then chooses a disc of matching colour from the table and without looking at the animal on the other side, places it in front of them. Play continues like this for a while but if you land on a coloured space with a gate on it some of your animals escape and that player has to return one of their coloured discs to the table without looking what animal is on it. Play continues until one player reaches the end space. This signifies the end of the game and a green must be rolled to finish. Once the game has ended each player can turn over their coloured discs to see how many animals they have. The winner is the one with the most animals. As you'll agree Games Compendium is a box crammed full of 4 very exciting and very enjoyable games. Orchard Toys have really made a brilliant fun box. I love that each game teaches number counting, colour recognition, shape recognition, memory skills and matching skills. It really is a perfect box of games and at £15.95 it's a perfect price as well. I'll definitely be recommending to friends and family as a fab birthday/Christmas gift for kids as price point, quality and learning factor are ace! I was sent the Game Compendium box in return for an honest review. Year after year it seems that Halloween is getting bigger in the UK and becoming more of a celebrated holiday like they do in the US. I must admit that pre children the other half and I would turn all the lights out, sit in the dark and not answer the door! How horrid of us I know however now that we have kids it's a whole different story. The first time I took my son trick or treating was when he started school. A bunch of us Mums got together with the kids and walked around all our neighbours doors in fancy dress singing or telling jokes in exchange for some sweeties. The kids love it and we've been doing it every year since they were 5. I do make sure and leave some sweets with the other half for when people knock on our door though. That's kind of our little Halloween ritual and hopefully it's something we can keep on doing until the kids eventually grow out of it. When I was young and in primary school we would go out trick or treating (or guising as they call it in Scotland) but it wasn't for sweeties, it was for money and you honestly would come home with pockets loaded full of change. Thankfully it's more the American way now where you gets sweeties or else I wouldn't be answering the door! 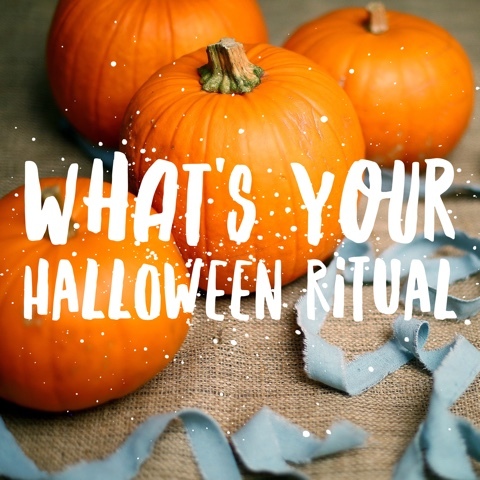 Anyway, I love hearing what other people get up to on Halloween and I have some lovely parents who've kindly shared their Halloween rituals with us so read on to see what other people get up to with their kids on Halloween. Sarah from Champagne and Petals says: "We get the kids dressed up and take them to 'trick or treat' on family and friends doors. Which often means jumping in the car to drive around. We never go anyone we don't know. I think it helps them to go trick or treating without really doing it. I always have some sweets in the house ready just encase little monsters turn up at the door. They have a school party so they go to that dressed up." Emma from Life in the Mum's Lane says: "I love Halloween. We carve pumpkins & put decorations up. I always buy sweets for kids that come knocking. I usually stay in & my other half takes my children to a few friendly houses. We never go to a house with no decorations up. I also usually go on a pumpkin hunt at Castle Ashby & last year went to a fab family friendly community party." Catherine from Mama Cat + Baby Bee says: "We love Halloween and autumn. We go to a pumpkin festival to pick our pumpkins and then have a special afternoon carving them with autumnal treats to nibble and drink. 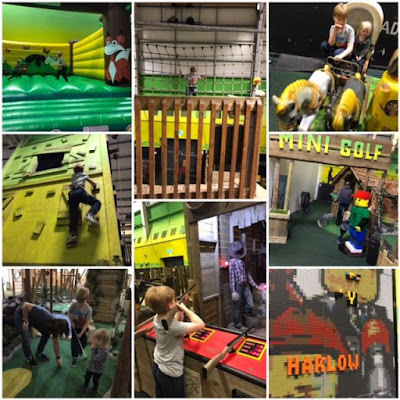 We usually find a family friendly party to go to and some autumnal/Halloween days out. We don't trick or treat, but we will give out candy to any callers. I like to decorate the house by adding to Bee's seasonal display and putting up our Halloween ornaments, toys and books." Pete from Household Money Saving says: "We used to turn off the lights and watch TV upstairs. Since we've had kids, they dress up and hand out sweets to other people's children. We also go to a couple of neighbour's houses trick or treating, but we always clear it with them first." Emma from Emma Reed says: "I love Halloween. I will get dressed up, I will dress the front of the house with a few props and spider webs and I carve out pumpkins to sit on the wall at the side to spook the visitors! We've had a couple of small gatherings for the kids to have some fun and we welcome any trick or treaters- these usually end around 8pm in our area. All good fun!" Sophie from Soph-Obsessed says: "Halloween is our fave time we all dress up even our dogs) and we decorate the house and welcome any trick or treaters! My son who is now six loves giving out the sweets to those that knock on the door! It's our little tradition!" Debbie from My Chaotically Eclectic Life says: "It varies from year to year depending on what day it actually falls. In the past the kids have got dressed up and go trick or treating locally or gone to a family Halloween party. If we are in we always have treats available and we decorate the house. The decorations are getting bigger each year. We love going to some of the local Halloween events too such as Scarecrow Trails and pumpkin picking." Helena from The Queen of Collage says: "We celebrate Halloween by decorating the house. 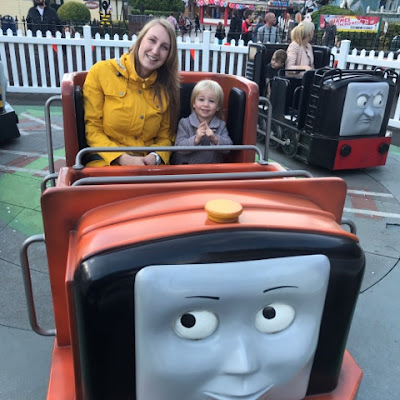 I think my little ones are a bit too young to understand it but when they are I hope to stick with what I did as a child and let their friends know they'll be visiting." Christy from Welsh Mum of One says: "We try to dress up and go to an organized party. A local family-friendly pub does some great events on Halloween. If there was nothing on we'd probably try and organize something ourselves for friends and family. No one really goes trick or treating my area so that's not really an option but I think it's a fun opportunity to celebrate and dress up." Kim from Raising A Ragamuffin says: "We don't celebrate Halloween on the day generally. However, we do go pumpkin picking to then carve/decorate. Last year me and daddy carved our pumpkins and ragamuffin painted hers." 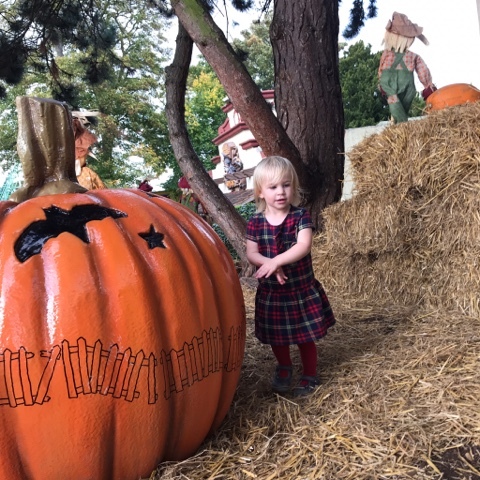 Emma from The Money Whisperer says: "We love to go on a proper Halloween pumpkin trail. The children all had to find the pumpkins in the grounds and copy the designs of the unique pumpkins on to an activity sheet to get a spooky treat at the end. We all loved it!" Veronica from My Parenting Journey says: "We have 3 kids and they're always looking forward to dressing up on Halloween and we trick-or-treating a night early to get extra candy! lol Also, we never miss our annual Halloween movie marathon :)"
Lianne from Ankle Biters Adventures says: "I decorate the house from top to bottom. We go pumpkin picking , on pumpkin trails and also have a party I even do party bags - Halloween is my fav." Leyla from Motherhood Diaries says: "The boys always go trick or treating while I prepare a Halloween - inspired feast for the friends and family on the street. I love Halloween, as it's my chance to get creative with the pumpkins, decorations and food."